Welcome to Class 7A, Region 3, where Pinellas Park, Plant City, Bloomingdale and Tampa Bay Tech dwell. Also known as the region with the highest winning percentage in the state. Tampa Bay Tech started the season by beating defending Class 6A state finalist Armwood. It was the first time the Titans had knocked off their nemesis since 2001 and ended up being the Hawks' only loss in the regular season. But TBT stumbled late, losing three of its last four games — all to playoff teams. Two of the three were by a combined four points. Because of their slide, the Titans did not win their third straight district title. In fact, they barely held on to a playoff spot in the Florida High School Athletic Association's points-based system despite a 7-3 record. Their reward was a No. 8 seed and a first-round trip to play top seed and defending Class 7A state champion Venice (9-1), the team TBT lost to in last year's region final. Welcome to Class 7A, Region 3, perhaps the toughest in the state from top to bottom. "It's a monster," Titans coach Jayson Roberts said of the region. "If you come out of it, you can kind of beat your chest a little knowing that you had a tough game in every round." The Titans finished with a power ranking average of 40 points, which would have been good enough to finish between a fifth and sixth seed in any other region in 7A (district champions automatically get the top four seeds in each region). The 7A-3 region is one of only two in the state that includes a pair of undefeated teams — Pinellas Park (10-0) and Riverdale (10-0). Neither had a high enough average in points to earn the top seed. The list of quality teams goes on. Besides Venice, two other teams finished the regular season 9-1 — Bloomingdale and Plant City. Braden River was 8-2. Palmetto was 7-3. "You can look through the bracket and hope to get a favorable matchup," said Bloomingdale coach Max Warner, whose team will travel to Fort Myers to face Riverdale. "There just isn't one in this region. They're all tough." The overall record of the eight teams in the region: 69-11. The .627 winning percentage is the highest of any region in the state. The Patriots finally defeated district nemesis East Lake this season and won Class 7A, District 10, ensuring a home playoff game. Their reward for a 10-0 season and district championship? A rematch with Palmetto in the opening round. That's just how difficult Class 7A is. The Patriots, mainly because of a weaker schedule, earned a No. 2 seed in their bracket. Palmetto is 7-3, with losses to Manatee, Braden River and Venice. The Tigers defeated Pinellas Park 28-24 last season. "Going into our (last) game we thought it was going to either be Tampa Bay Tech or Bloomingdale," Pinellas Park coach Kenny Crawford said. "Then all of the sudden a couple guys win, a couple lose and the next thing we know we have a rematch with Palmetto. It's one of those things where, just because of how good everyone was, the chances of playing the same exact team were slim to none and now we're doing it." 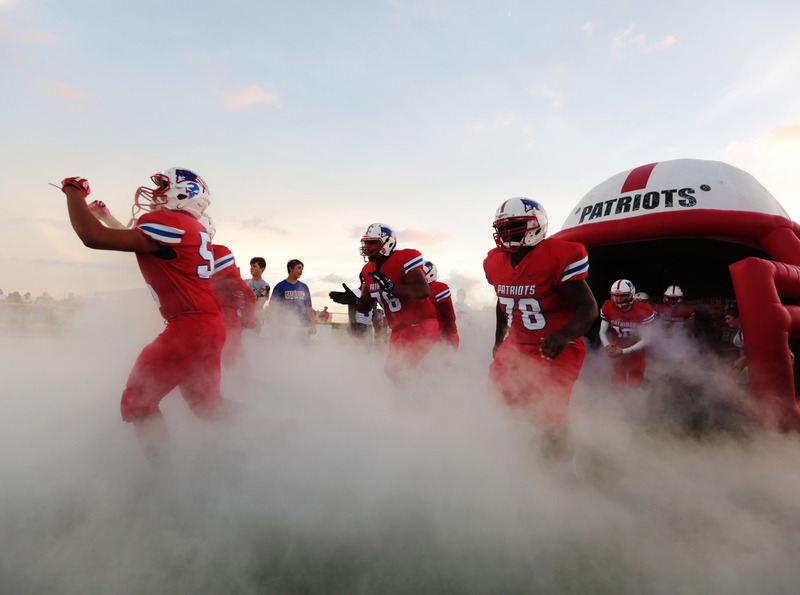 Pinellas Park has never made it past the second round of the playoffs. It has only won two first-round games. This may be the best team the Patriots have taken into the postseason. Quarterback Brandon Coppola has thrown for 1,543 yards and 22 touchdowns. Running back Lawrance Toafili has 1,329 yards and 16 touchdowns. Key on him and Derek Bryant (979 yards, 11 touchdowns) can carve up a defense. And Pinellas Park's defense has given up only nine points per game. "We're a much different team," Crawford said. "We're so much more multiple now. You can't look at last year's film. We're totally different. We have so many more personnel groupings." Crawford said despite facing Palmetto again, the new playoff point system is better than in the past. "It's not like the old days where you win your district and you're going to play the runnerup of another district that isn't awesome but got in anyway," Crawford said. "Every single one of these teams is a grinder. I like it better this way. The old way you might win a game against somebody who didn't belong there and then have false hopes going into the next game. Now, if you start winning games you have a chance. "Everybody is a couple plays away from being equal." Plant City's last playoff appearance in 2015 ended with a loss to Braden River in the region finals. On Friday, the Raiders (9-1) return to the postseason against the same opponent, this time in the quarterfinals. It is a difficult matchup. The Pirates are 8-2. Their two losses are to powerhouse programs Jacksonville Trinity Christian and Venice by a combined eight points. "I told the guys that they're all tough the rest of the way," Plant City coach James Booth said. "This is about as tough of a matchup as you can get in the first round." James Gordon, Tyreke Harrison, Kobe Panier and Ashton Mincey were all freshmen who played on defense the last time out vs. Braden River. The four are all starters now who will have big roles in stopping the Pirates' ground game. The biggest task is bottling up Braden River running back Brian Battie, a junior who has rushed for 1,692 yards and scored 23 touchdowns. The Pirates also have a passing game. Bryan Gagg, a senior, has thrown for 1,792 yards and 19 touchdowns. But Braden River lost its biggest receiving threat with Knowledge McDaniel being ruled ineligible for the playoffs for receiving impermissible benefits. McDaniel, a senior, is a three-star recruit with more than 20 offers. He had 436 yards and 11 touchdowns in the seven games he played this season. "With McDaniel out, it takes a weapon away from their passing game," Booth said. "It makes it that much more important to stop the run. We can do it. Our guys have played well all season." 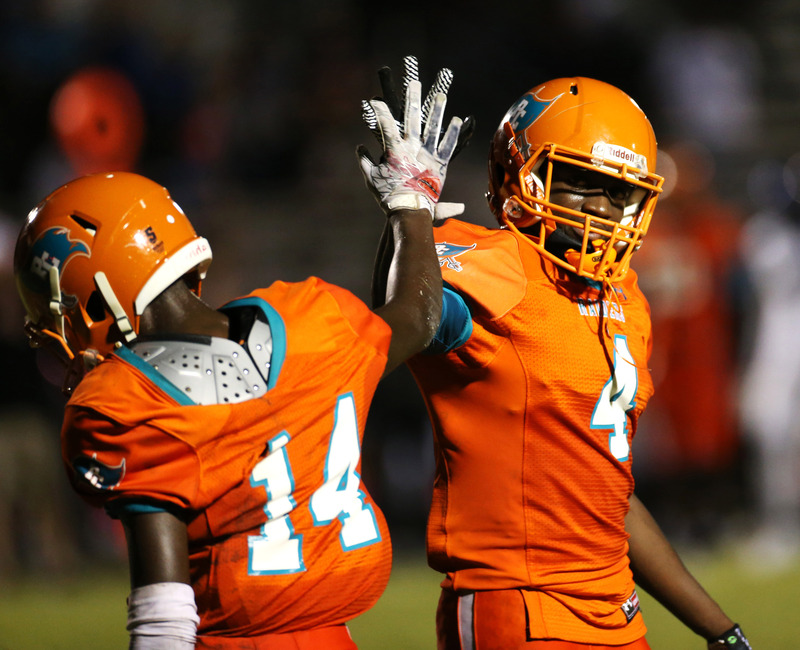 Plant City's turnaround is due in large part to the improved play of its defense. Last year, the Raiders gave up an average of 27 points per game. Now they're allowing 14. Gordon, a linebacker who has already committed to Minnesota, has led the way with 110 tackles, seven sacks and four forced fumbles. The goal for Bloomingdale at the start of the season was to win the school's first district title and host a playoff game for the first time. Instead, the Bulls lost to Plant City three weeks ago, ending their title hopes. The Bulls (9-1) got into the playoffs as the No. 6 seed. Now the objective is to win a postseason game for the first time. To do that, Bloomingdale has to travel 250 miles round trip to Fort Myers for a quarterfinal against undefeated Riverdale. The Raiders have gone through a remarkable transformation, becoming just the seventh team from Lee County ever to go undefeated in the regular season. Their perfect mark comes after seven straight non-winning seasons. "I'm sure it's going to be a pretty electric atmosphere down there," coach Max Warner said. Bloomingdale will have plenty of support. The school has ordered six charter buses for the trip. The band will be there. So will the cheerleaders and student section. "It's a big deal," linebacker Landon Moody said of Friday's game. "You can feel the energy around the school and even though it's two hours away, I think a lot of people are gonna travel." Moody and his defensive teammates have done some impressive things this season, setting school records for points allowed (68) and shutouts (six). Their biggest task Friday is stopping a Riverdale offense that has rushed for nearly 4,000 yards and scored 49 touchdowns. Raiders coach James Delgado was a former player and assistant at Apopka, a powerhouse that has won three state titles since 2001. Delgado brought with him the single-wing offense the Blue Darters ran with great success. In the single-wing, a running back receives shotgun snaps and often takes off with the ball. Another running back lines up next to him and sometimes gets the ball. There are many play fakes and many ball carriers, but few passes. "It's something that you don't see all the time," Warner said. "If we have trouble making the right adjustments and stopping it, we're in for a shootout." Warner saw the offense in person when he attended Apopka's 2013 state semifinal at Plant. "It's been a while since I've even seen it," Warner said. "About the closest we've come to seeing something like that is when we play East Bay (which runs the veer)." 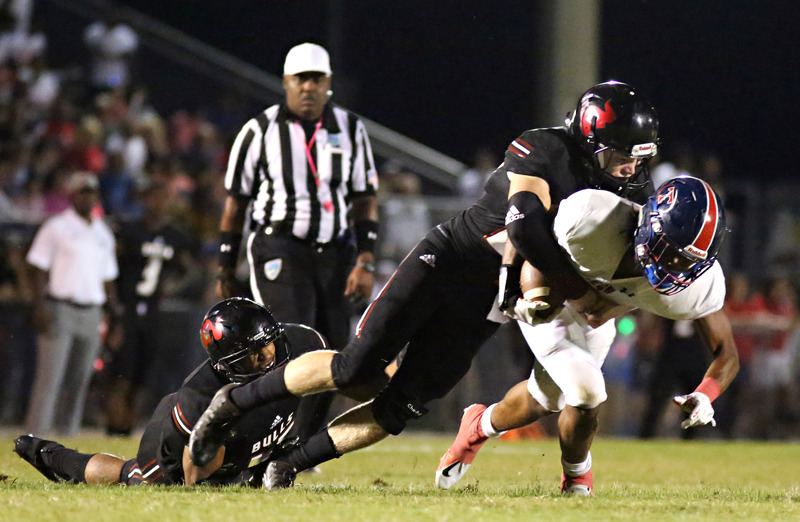 A Bloomingdale win and a Pinellas Park loss in the first round would give the Bulls something they wanted from the start: a home playoff game. "We still have a lot of goals in front of us," Warner said. "The biggest is we need to win this one." This year's playoffs begin where last year's playoffs ended: Venice. The Indians are the top seed in the bracket after a 9-1 season. They are the defending Class 7A state champs. Clearly, this is not an easy assignment for the Titans. But it wasn't a surprise. 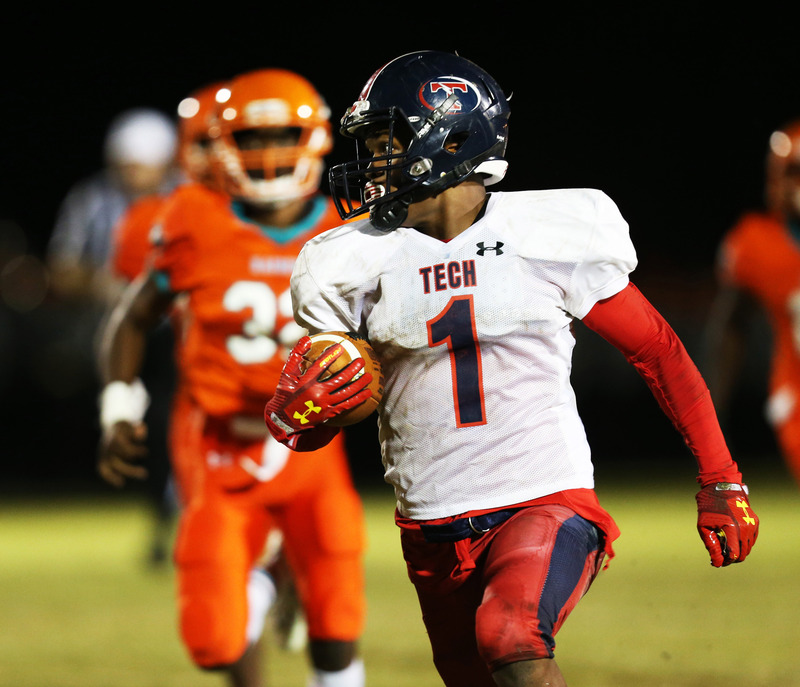 Tampa Bay Tech won its first six games before limping to the finish line with a 7-3 record. Even before the playoff brackets came out Sunday, the Titans were preparing for Venice. "By the time we got to the locker room (after Friday's loss to Gaither), the Venice coach sent me a text that said they did the math and they knew they were going to play us," TBT coach Jayson Roberts said. "We had already exchanged film before Friday night was over." This is not the same team that lost to Venice in the region final last season. Quarterback Michael Penix Jr. is now at Indiana. Sophomore David Wright has filled in admirably, throwing for 947 yards. But he does have more interceptions (seven) than touchdowns (six). The key is the health of running back Treshaun Ward, who has been bothered by an ankle injury for most of the season. He had only four carries in the loss to Gaither. But Roberts said Ward has been getting treatment and participated in every practice this week. Ward still has gained 1,010 yards and scored a team-high 12 touchdowns. As expected of a top seed, Venice is balanced on offense. Quarterback Hayden Wolff has thrown for 1,854 yards and 17 touchdowns. Running back Brandon Gregory has gained 926 yards and 23 touchdowns for a rushing attack that has totaled 2,039 yards. If there is one silver lining for the Titans, it's that many of the returning players at least know what to expect in Venice. "There are a lot of takeaways from going there last year," Roberts said. "When you get over there you have an appreciation for the atmosphere. It's almost like a small college. I think last year when we went there our kids were taken aback and got sidetracked. I think we lost focus. "I told them that if we want to accomplish our goal of getting to the state championship then we have to play this game regardless. It just happens to be the first game." Tampa Catholic alum, 19, wins over the most difficult of the NBA team’s fan base while playing for one of the league’s youngest clubs. The Ravens, who had to rebuild after winning Class 2A a year ago, top Steinbrenner 27-2.